Please deliver to.....: Birthdays are nature’s way of telling us to eat more cake. Yay! A letter for me! Ive got much to say and Ive missed your wonderfulness. I know, it's my fault! I have 2 things to send you and one of them was supposed to be mailed today but I forgot it on my desk when I went to the post office at the end of the day. GGRRRR! The other one was supposed to be mailed at the beginning of next week, but it will be delayed since thing #1 didn't get sent. So #1 will be mailed early next week and #2 will be mailed at the end of the week. And by then hopefully my letter will be done and you'll receive 3 wonderful things from me in the mail! Life will be worth living! Please don't despair. Really good incoming mail big time. 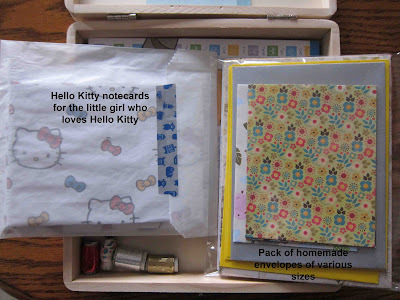 Also nice kit I love how you made it. Hey, happy birthday to your niece :P I think she'll love the present you've created for her; I mean, seriously, she'll think you're the coolest aunt ever! LOVE the kit! I've made a few over the years as gifts for people as well! I think because I've always wanted to receive one... HAHA Your Niece is going to LOVE it! That moment when I saw the kit...o_0 Just perfect thing! Oh, this kit is SUCH a perfect gift. I love it! You stole my idea! I don't know how but clearly you did. And then you made it way more awesomeamazing than mine. Pfft. (My 8yo nephew is freakishly clever, just like my middle sister was as a child. Me? I was and remain boringly average. Anyways, that's not my story! 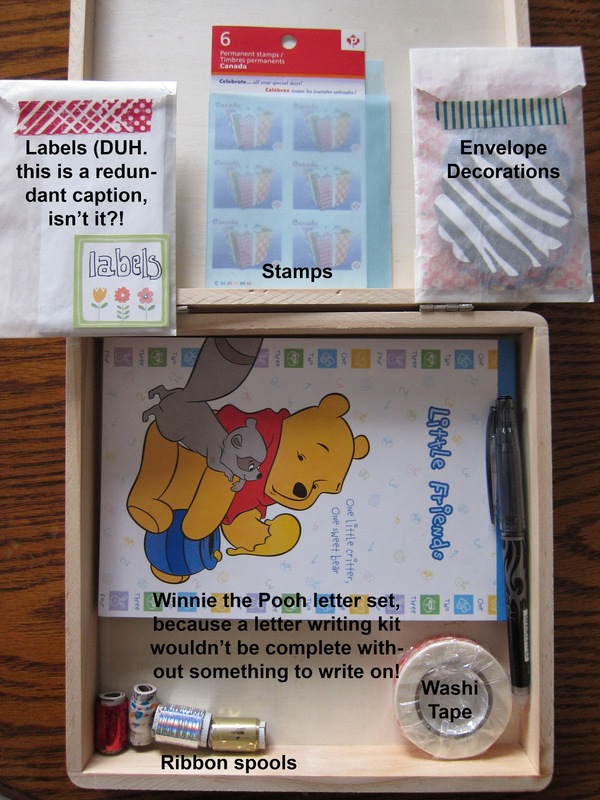 He likes to write and draw and read so I put together a kit for sending postcards for him for Xmas. There's postcards in it, postage stamps, pens and stampers, an address book... I went with postcards because he's not writing letters yet but I thought they'd be a fun introduction to the world of snail mail. And that was where I was going with this comment, it just took me awhile to get there).